Volvo has offered in-car delivery in Europe as part its Volvo On Call app since 2015. The service is available in Sweden, Norway and Switzerland. Volvo Cars is forming a partnership with Amazon to offer customers in-vehicle delivery of packages in the United States. Starting Tuesday, it will be available in 37 U.S. cities with plans to expand the service rapidly. Volvo hopes to cater to high-end customers with busy lives by offering a convenience that leverages Amazon’s size and reach. Technology, connectivity and software are allowing automakers to extend the role and utility of light vehicles in ways beyond transportation -- in this case transforming a sedan or crossover into a temporary drop box or secure locker. “The ambition is to work toward full national coverage,” Volvo Chief Digital Officer Atif Rafiq told Automotive News Europe without providing a target for when nationwide service would be reached. The current coverage area for the service, called Amazon Key In-Car, coincides with large U.S. metropolitan areas where the online retail giant already offers Amazon Key, a service available to Amazon Prime customers that debuted last autumn that allows packages to be delivered inside a customer's front door without giving the courier an actual key. The same idea will be applied to Volvo owners who download the Amazon app and link their Amazon Prime account with their Volvo On Call account. After the setup is complete and a delivery location is registered, customers can shop on Amazon.com and select the “in-car delivery” option at checkout. The Amazon and Volvo apps will notify the customer when the delivery is about to happen, when it is completed and when the vehicle is safely locked. Rafiq said that the service will be accessible to the majority of Volvo owners in the U.S. Amazon estimates that millions of Amazon Prime customer will also have access to the program. “With Amazon Key In-Car, we're fueling another convenient and secure way to get packages to our customers,” Amazon Vice President of Delivery Technology Peter Larsen said in a statement. 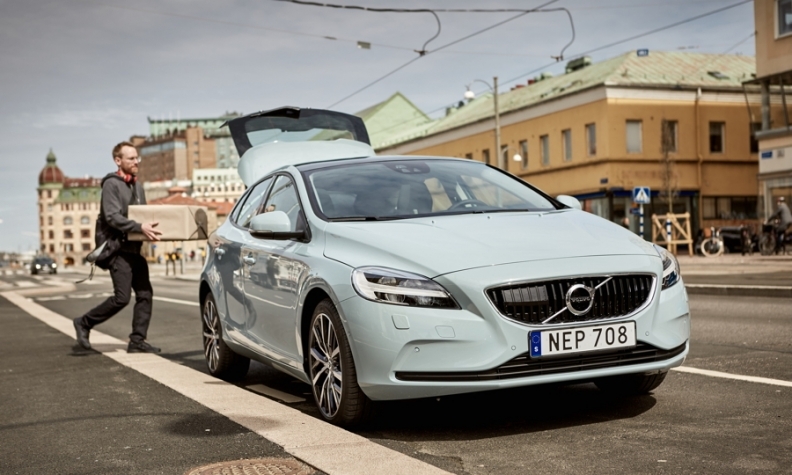 Volvo says it was the first global automaker to offer in-vehicle delivery. The service started in Europe in 2015 as part its Volvo On Call app, which allows one-time digital access for deliveries to a customer's Volvo in Sweden, Norway and Switzerland. Volvo said there have been thousands of successful in-car deliveries in Europe in cooperation with PostNord, Swiss Post and numerous retailers. The automaker sees the Amazon partnership as a considerable scaling-up and maturing of its connected services. General Motors has also partnered with Amazon to offer customers in-vehicle delivery of packages in the United States. The service is available on more than 7 million 2015 model year or newer Chevrolet, Buick, GMC and Cadillac vehicles for GM. It comes free for Amazon Prime members with an active OnStar account.